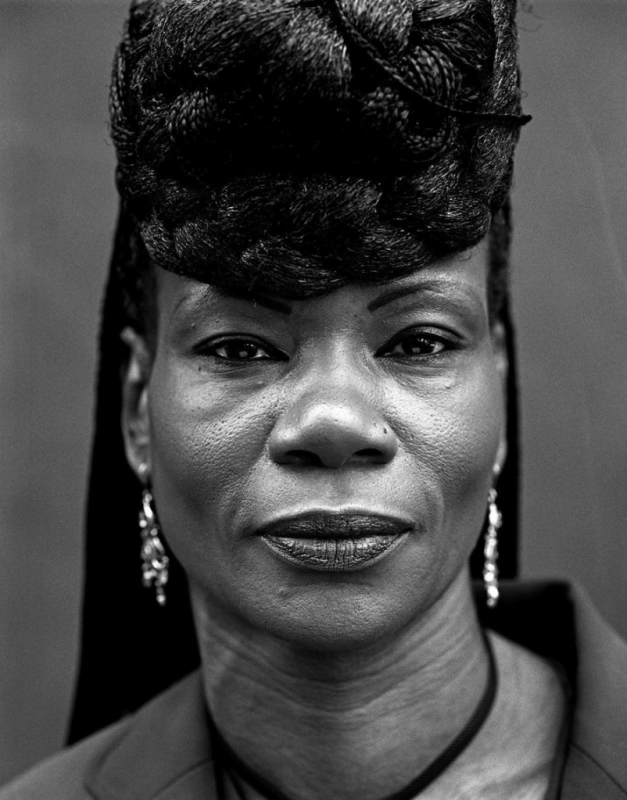 In July of 2007, while I was working on my Faces On The Street series, this woman passed by and agreed to stand for a portrait. She was in a hurry and allowed me only 3 frames. It’s quite a challenge to make a good portrait on the street in less than a minute. I can give only the briefest direction, which is usually spent discouraging poses and smiles. Because of this woman’s unusual dress and hair, I moved the camera back to be more inclusive. The framing eliminated it from my Faces series, but as a stand-alone street portrait, it has become one of my favorites. I got a Kodak Brownie at age 6, and my first darkroom at age 13. Assisted Hollywood photographer Sid Avery in my early 20s and photographed artists for the music industry in my late 20s. Quit commercial photography to pursue personal work in my 30s. Won 1st Place in American Photo’s Annual Contest (People & Portraits category) in 2002. One-man show: The Portraits At Sam’s Market, 1998. Group shows: Art of Photography 2006 and 2008. Gallery: Photographers Showcase, PhotoEye.com.